Meth and Fentanyl Laboratories - Two of the most important issues the states of Pennsylvania, New York, Maine, Hew Hampshire and Massachusetts face today is health risks and property damage associated with methamphetamine and fentanyl production contamination. Meth Lab Cleanup Company is an environmental firm on the forefront of the clandestine drug lab decontamination industry. 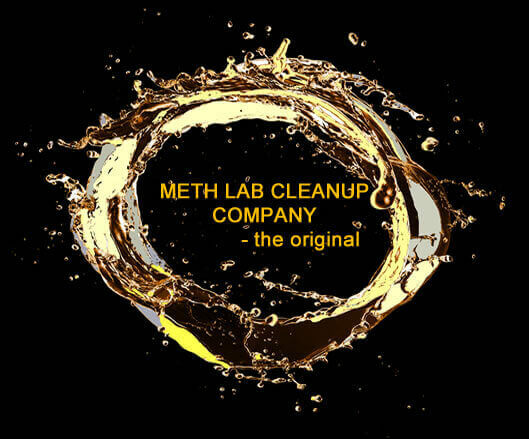 Meth Lab Cleanup's seasoned team of professionals provide superior solutions for meth lab testing and decontamination. Recognized for excellent customer services and industry-leading technical expertise, Meth Lab Cleanup specializes in comprehensive site assessment, work plan development, regulatory adherence, full service decontamination and quality documentation. Value-Added Services - Meth Lab Cleanup Company is committed to developing solutions that support growth though technology development, innovation and a firm commitment to deliver value-added services that protect people and sustain property value. A past performance evaluation relied upon by the US government rated Meth Lab Cleanup Company with an overall performance rate of 94%. Meth Lab Cleanup's clan lab decontamination course is recognized in all states requiring contractor certification. Customer Accountability - We pride ourselves on being the leaders in the clandestine drug lab testing and decontamination industry. We hold ourselves accountable to our customers, our regulators, and our technicians by honoring our commitments, providing results, and striving for the highest quality. Meth Lab Cleanup Company accomplishes this through its certified specialists, unmatched knowledge and experience, and industry-leading technologies, products and services. Twenty-five states have enacted clandestine drug lab assessment or clandestine drug lab decontamination laws, or both. Those states include: New Mexico, Idaho, South Dakota, Nebraska, Minnesota,Washington, Oregon, Idaho, California, Utah, Arizona, Montana, Colorado, Wyoming, Arkansas, Minnesota, Michigan, Indiana, Kentucky, Tennessee, West Virginia, North Carolina and New Hampshire. Several states have guidelines in place. For more information, visit our Regulations web page. Many cities and counties in regulated and non-regulated states have also enacted clandestine drug lab decontamination ordinances. The DEA posts a registry of addresses of several locations where law enforcement agencies reported they found chemicals or other debris associated with either clandestine drug laboratories or discarded production materials. This listing is not all inclusive, many sites are unreported. Visit Wikipedia's state and local law enforcement listing for police and sheriff's office (Drug Task Force) contact information for the states of New Hampshire, Massachusetts, New York, Pennsylvania, Vermont, and Maine. The High Intensity Drug Trafficking Areas (HIDTA) program, created by Congress with the Anti-Drug Abuse Act of 1988, provides assistance to Federal, state, local, and tribal law enforcement agencies operating in areas determined to be critical drug-trafficking regions of the United States. Wikipedia also has an online listing of health departments. Find the Massachusetts, New York, Maine, New Hampshire, Pennsylvania and Vermont contact information you need for further information on clandestine drug lab programs and requirements, if available. The oversight of contaminated property is usually the responsibility of the Environmental Health Department within the county or state Health Department. Choose traditional clandestine drug lab testing and decontamination classroom training, recognized throughout the United States or convenient, certified online training courses. We will come to you or you can learn virtually, Meth Lab Cleanup Company offers both. Our instructors are field experienced and nationally recognized. Our on-line training is comprehensive, easy to navigate and affordable.